A comforting side dish for chilly fall nights, I love roasting a variety of vegetables this time of year. This type of dish is very easy to prepare, and lends itself well to customization. Experiment with different vegetables and various seasonings to make your perfect dish! Preheat oven to 425 degrees, place veggies in a baking pan/sheet and drizzle with extra virgin olive oil, toss with a tbs of rosemary, a tsp of time, a tsp of black pepper, and a few shakes oregano and chili powder, (a tsp of sea salt optional), make sure all the veggies are coated in olive oil, bake for about 45 minutes, stirring everything well once or twice during cooking. 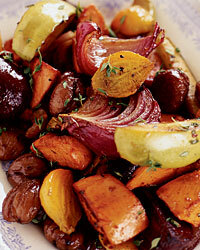 Eat as-is or drizzle with a bit of balsamic vinegar! YUM!